Our men's residential Christian alcohol and drug rehab intensive treatment and rehabilitation alternative is one of the most value packed recovery centers in the United States. 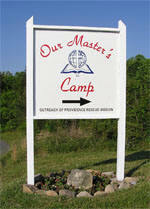 Our Master’s Camp is located on 100 acres of land in a remote mountain location of beautiful Tennessee. Our location provides a safe place for clients to gain serenity and peace while discovering God’s intended and perfectly designed plan for their lives. No one aspires to have their goals and dreams swallowed by the deadly and powerful heartbreaking grip of alcohol and drugs. God wants us to grow along spiritual lines, live abundantly, and have serenity and peace. Just as it says in Isaiah 26:3, "You will keep in perfect peace those whose minds are steadfast, because they trust in you." Our Christian drug and alcohol recovery program has a time tested rules and agenda process that enables men to straighten out their struggles with addictions to substances such as alcohol, cocaine, crack, heroin, opiates, barbiturates, marijuana or pot, crystal meth, meth or methamphetamine's, prescription drugs, and pain pills to name a few. In 1978, Our Master's Camp founder Roy Johnson realized that no human power could relieve him of his substance abuse nor give him the forgiveness, love, peace, and purpose he needed. Once he trusted God, his life had a dramatic change. He found the peace that Jesus gave him to be so awe inspiring, that he knew it was the only way to truly help the alcoholic or addict that still suffered. The mission he created really works because it identifies and corrects long held "false" belief systems that occur in all who struggle. The Bible is God’s blueprint for our lives and Jesus Christ can heal our brokenness. Jesus Christ changes lives. Please visit our web site or call us at (423) 447-2340 for more information.